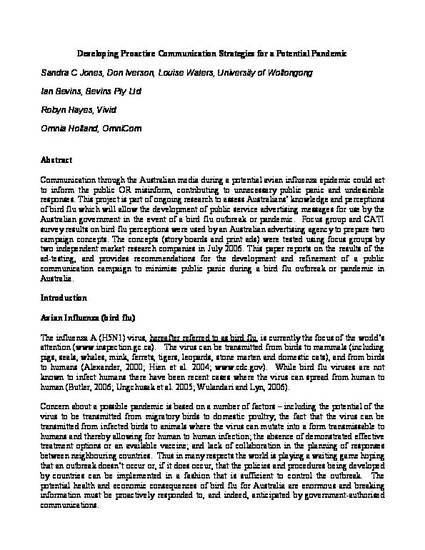 This conference paper was originally published as Jones, SC, Iverson, D, Waters, L, Bevins, I, Hayes, R and Holland, O, Developing proactive communication strategies for a potential pandemic, Proceedings of the Social entrepreneurship, social change and sustainability: International Nonprofit and Social Marketing Conference, Brisbane, 27-28 September 2007. Communication through the Australian media during a potential avian influenza epidemic could act to inform the public OR misinform, contributing to unnecessary public panic and undesirable responses. This project is part of ongoing research to assess Australians’ knowledge and perceptions of bird flu which will allow the development of public service advertising messages for use by the Australian government in the event of a bird flu outbreak or pandemic. Focus group and CATI survey results on bird flu perceptions were used by an Australian advertising agency to prepare two campaign concepts. The concepts (story boards and print ads) were tested using focus groups by two independent market research companies in July 2006. This paper reports on the results of the ad-testing, and provides recommendations for the development and refinement of a public communication campaign to minimise public panic during a bird flu outbreak or pandemic in Australia.